← Are you teaching your horse to brace? From time to time I read something posted that suggests that guessing during the shaping process is frustrating for the horse. My experience is that we can easily teach our horses to be creative if we set it up to follow their direction and encourage their interaction with some item in the environment. This is especially true when they’re beginning to learn to offer behavior. Once a horse learns to play the game of “show me something different” it can totally change their understanding of how shaping works. Truthfully, I think the horses are capable of understanding shaping quickly, but WE need to understand that they also explore new things in their own individual manner. Some make bold, easily recognizable efforts, others make very small moves to investigate. It can be hard to sort through what we’re seeing and sometimes the human withholds the click, either wanting too much change in the variations of behavior, or they wait for something that the horse cannot give in the moment. “Different” doesn’t have to be grandiose, it can literally be a shift in eye movement. Watch this video of my friend’s horse. 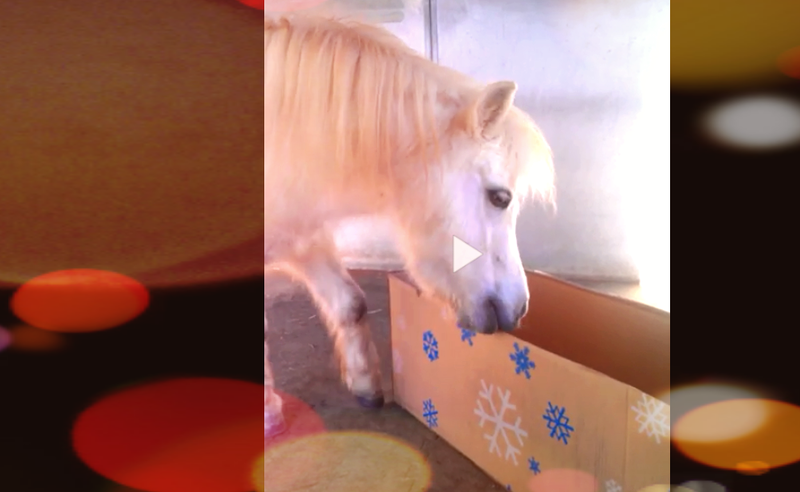 You’ll see this horse try a variety of ways to interact with a box. He’s quite clever at offering different behaviors, but this process was LEARNED. There are some moments where you might see behavior offered that is clicked after it is finished, or you might see the horse continue to offer the behavior after the click has happened. With the exploratory games where behavior is offered spontaneously we are encouraging variety. Sometimes that variety is also very reinforcing to the horse. If he ignores the click, I let him explore, but I let him explore without clicking. Sometimes I interrupt the exploring, sometimes I let them move to a new behavior after they have exhausted the current interest PROVIDING it’s not a behavior that can lead to some useful behavior I might want to capture and shape in the future. I have ALSO done this type of exporatory training with no click at all, just feeding them as they continue to investigate. creative shaping Watch this video to see more about shaping games. Once there is some variety to the horse’s offerings, we can begin to shape behaviors that are useful to us that range from husbandry to riding. So the next time you read an article that suggests that horses NEED to have R- in their lives because they get too stressed by guessing, come back to this page and learn how you can make the process fun and easy for both of you. There is an ongoing resource of information in my groups and online classes as well. SHAPING!!! It’s a GREAT tool to have in your toolkit.